“It’s a family home; it’s not taking itself too seriously,” says Shane Cotter who with Kathryn Wilson founded the award-winning architects practice Architectural Farm, who in 2014 were listed by Wallpaper magazine as one of the top-twenty best young architectural talents in the world. 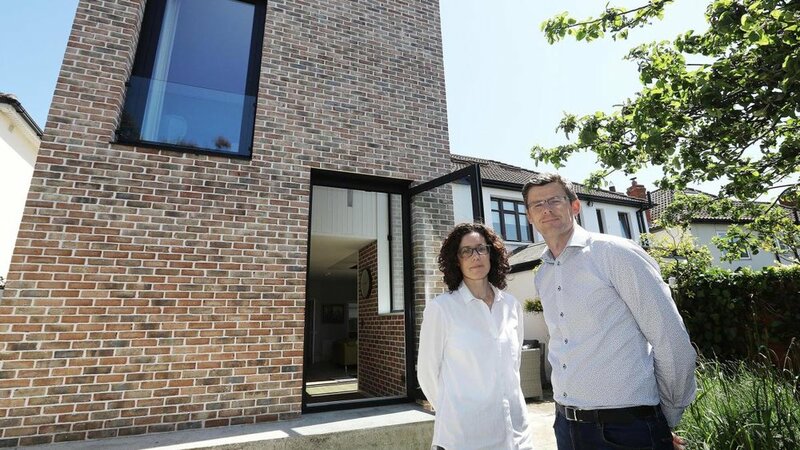 We’re talking about their extension and renovation to a typical 1930’s Dublin brick house on The Stiles Road, Clontarf East — what they have done is anything but typical. The house began as space for a family of two who over the fifteen-years of living there grew to four. The house changed too; renovated and extended to cater for the growth, but as the family grew in size their needs changed. The layout of the house — small, separate, dimly lit rooms, no longer worked. This is Architectural Farm’s territory who since starting in 2010 have built a reputation, for among other things, their work to seemingly ordinary houses. To do this they addressed the garden with what Kathryn calls a “social façade’” — like I said, this isn’t a typical extension. Shane and Kathryn talk this way about all their projects, regardless of what they are — like, perhaps surprisingly for an architects practice, the bespoke kennel they are designing for two dogs in Cavan. The social facade has been created in what Shane calls “the brick tower” — a two-story brick box, framed between two existing trees, with a sloped roof that reaches out towards the garden. A concrete step leading down from the back door becomes a bench, on which, in the west facing sun you can sit and enjoy the garden. The garden-facing wall punctuated by two large openings — one to the kitchen and the other to the bedroom — create what Kathryn calls an “architectural and physical conversation.” It’s a strange way to talk about what is in-effect two windows in a brick wall but, with someone sitting on the bench, another leaning over the glass Juliet balcony and the sound of conversation drifting from the kitchen this simple yet beautifully proportioned facade comes alive — it becomes social. The brick tower is “stitched together” with the original house by a corner glass door that connects the internal living space with an existing patio that “gives the client the feeling of a bit more space but also allowed us to frame the view down into the garden” says Kathryn. The relationship between the outside and the inside of the tower is expressed by the use of brick internally. “It’s a big commitment to have brick inside your house as well as outside - you are living with it on a daily basis.” The commitment of the client was matched by Shane and Kathryn as they traveled around the city looking at how different types of brick had been used; how they had been laid; the way they had aged; the colour of the mortar. “Real care was taken in selecting the brick and the mortar," says Shane, in the end, opting for a white mortar. Internally walls have been removed, opening up individual rooms — that once worked for two but are now needed for four — into bright, usable and generous open-plan living spaces. But, the real success is the brick and timber-clad void stretching up from the kitchen-dining area through the full height of the brick tower. The additional height providing space for longer windows, pulling in even more light but also pulling your gaze outwards towards the canopy of distant trees and expansive sky. At night, lit by a single LED strip-light recessed into the timber cladding, the tower emanates a gentle glow, accentuating the large glazed apertures and casting subtle shadows onto the brick walls. The void meant a loss of floor area but, “the clients weren’t greedy for space” explains Kathryn “they were happy with a simple space, they saw the value of it.” It’s little architectural slight-of-hands like this that make what is quite a small build feel a lot more generous than it actually is. Architectural Farm have done something with this house that isn’t easy — they haven’t tried too hard. There are no architectural-gymnastics; no attention seeking materials yelling at you to ‘look at me!’ What this house reflects, like much of their work, is something you don’t always get with young architectural practices; a security and confidence in their craft. At The Stiles Road house this confidence has manifested itself in the form of a beautifully simple and well-conceived scheme — one that doesn’t take itself too seriously but is nonetheless a serious piece of architecture.